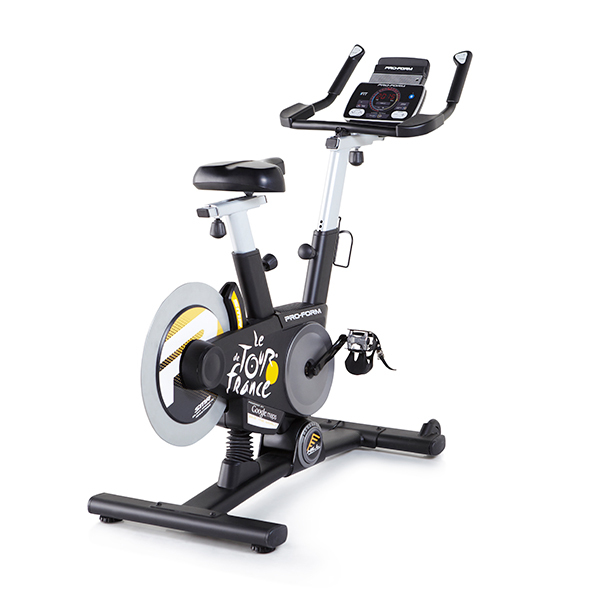 The ProForm Tour de France (TDF 1.0) indoor cycling bike replicates outdoor riding experiences like no other bike can. With an incline system that allows you to stimulate actual terrain and an array of other features, the TDF 1.0 exercise bike is designed to let you enjoy outdoor cycling experiences, indoors. 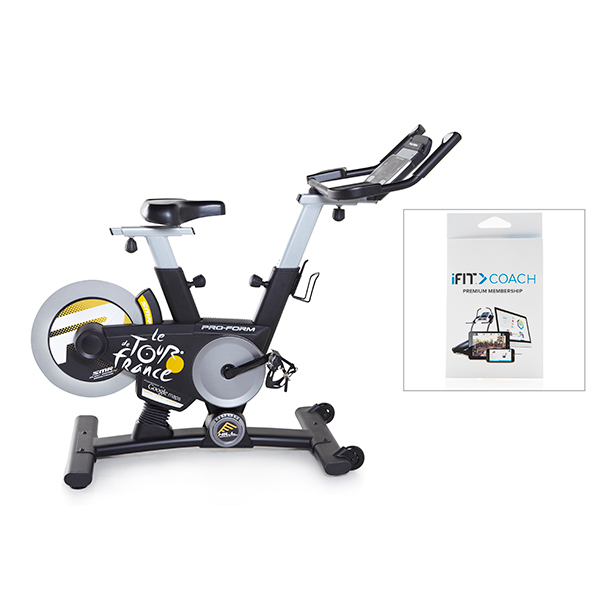 With your iFit Coach Ready bike, you won't want to stop pedalling. You also gain access to a new workout every day with the iFit Bluetooth Smart (BLE) enabled app, which automatically tracks your progress and allows you to compete with your friends. The Google Maps routes take you anywhere in the world, you just draw the course. 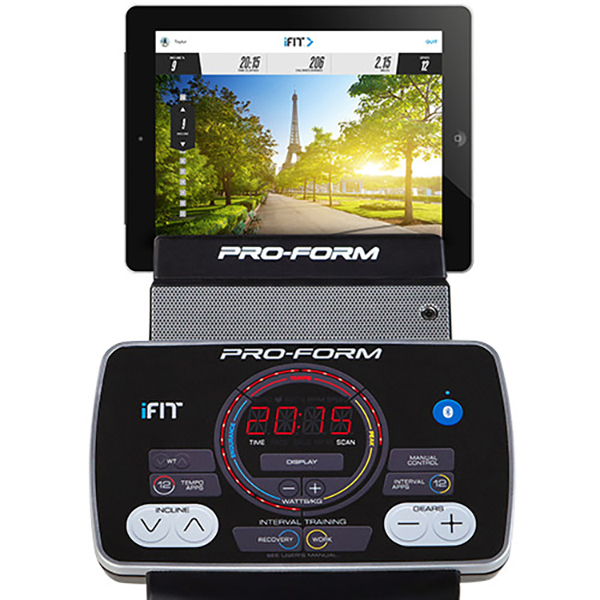 Enjoy the 24 pre-set workout apps, while your workout data is transferred to the Round Watts LED Display for analysis. Additionally, there is a Custom Performance Centre to monitor your workout data and progression. To imitate the feel of road bikes, the ProForm TDF 1.0 has 26 gears, a free-wheel clutch and a three-piece crank. It also supports uphill and downhill training with an impressive, automated 15% incline and 15% decline. With integrated quick touch handle controls, you are able to alter your workout on the go with ease. You can fully train all year for any course in the world. Meanwhile, stay entertained and motivated throughout your workout by taking advantage of the iPod compatible audio and two, two inch speakers. The Digital SMR (Silent Magnetic Resistance) will adjust silently and provide natural stability. With comfort in mind, there is an oversized seat with vertical/horizontal adjustments, ergonomic extra wide foot pedals with adjustable straps and oversized levelers for a comfortable, balanced and efficient workout. To improve the functionality of this machine, there are front mounted transport wheels enabling simple repositioning within the home environment. 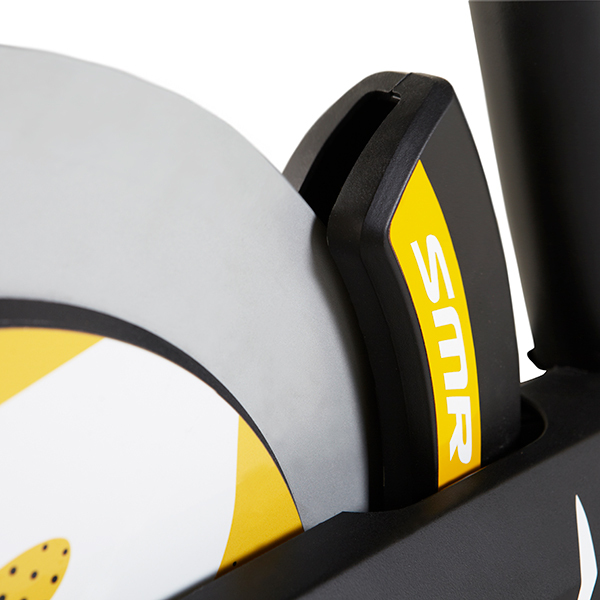 The TDF 1.0 Indoor Trainer Cycle is perfect for your at-home cardio training. 15% Incline and Decline Capability - Climb to a striking summit, finish with the strength of rigorous cross training. No matter the route, no matter the terrain, your TDF 1.0 automatically adjusts the incline and decline to simulate the actual landscape. With impressive 15% incline and -15% decline capability, you can fully train all year for any course in the world. 24 Pre-set Tour Workouts - Go from spectator to participant when you ride key sections of the tour. Choose from 24 workouts and ride a mountain stage or speed through a time trial. Electronic Gears - Take your training seriously. You can smoothly move through your 26 gears down the valleys and over the summits of your personal records. 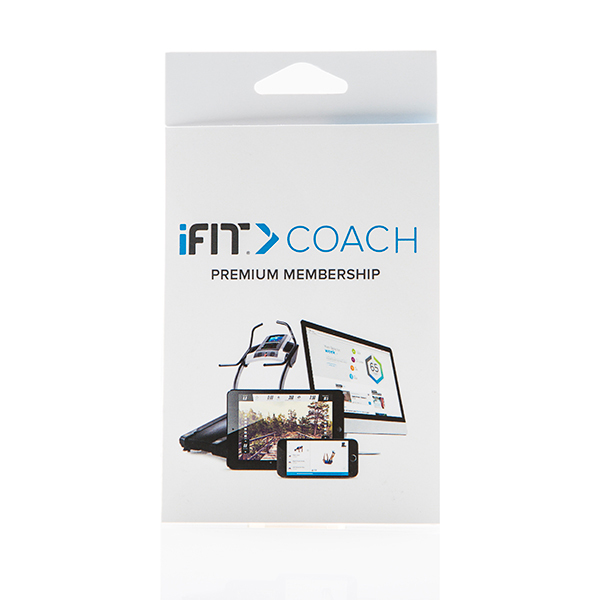 iFit Coach Ready - With iFit interactive technology*, you can bike anywhere in the world. Choose from 24 pre-mapped courses or create your own. 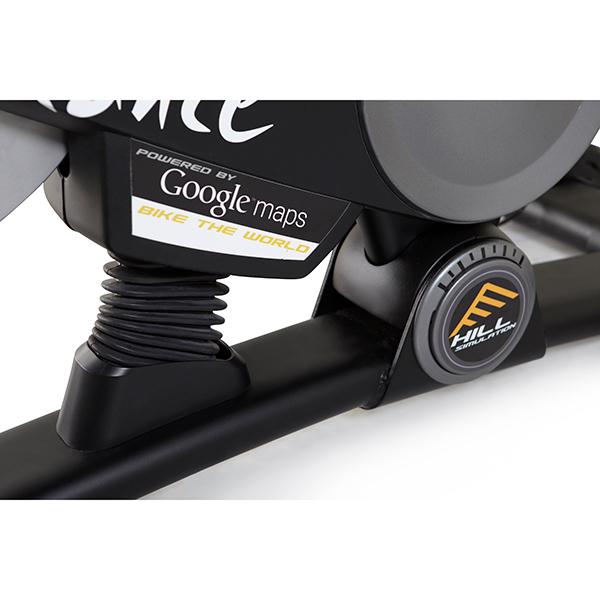 Tapping into Google Maps, this exclusive ProForm indoor cycle automatically simulates every hill and dip. Plus, you can track your progress automatically, compete with friends, and customize your workout to match your goals. Round Watts LED Display - Based on our power algorithm of watts per kilogram, the LED lights display your power output. Now you can tell instantly if you are in the Endurance, Tempo, or Peak zone. Endurance is a great area for a slow and steady workout. The Tempo zone places you in your ideal heart rate based on your weight category, and Peak is where you reach your cardio max. And if you are focusing on interval training, press the Work button to kick it in high gear and then press Recover to slow it down. Integrated Tablet Holder - Make fitness time, multi-tasking time. This device shelf keeps your tablet secure and conveniently close so you have access to all your training tools and entertainment must-haves. Transport Wheels - Easily move your indoor machine around the room with the built-in transport wheels. Adjustable Saddle - Work out in comfort with this ergonomic padded saddle. Adjust it horizontally and vertically to find the right fit. Compatible Music Port for iPod - Rock your workout to your favourite music. Simply plug your iPod* into the Intermix Acoustics Sound System and listen to incredible sound through two 2-inch speakers. *iPod is a trademark of Apple, Inc., registered in the U.S. and other countries. iPod not included. *Access your iFit account from your tablet or smartphone. Requires membership. The Bluetooth word mark and logos are registered trademarks owned by Bluetooth SIG, Inc. and any use of such marks by ICON Health and Fitness is under license. Other trademarks and trade names are those of their respective owners. Syncing iFit account from tablet to machine currently on Android and iOS tablets only. Tablet not included. Tablet requires Android 5.0and with Bluetooth 4.0and. iPad 3 and above with iOS 8 and up. Drive system: Power grade incline and decline with a 3 piece crank. 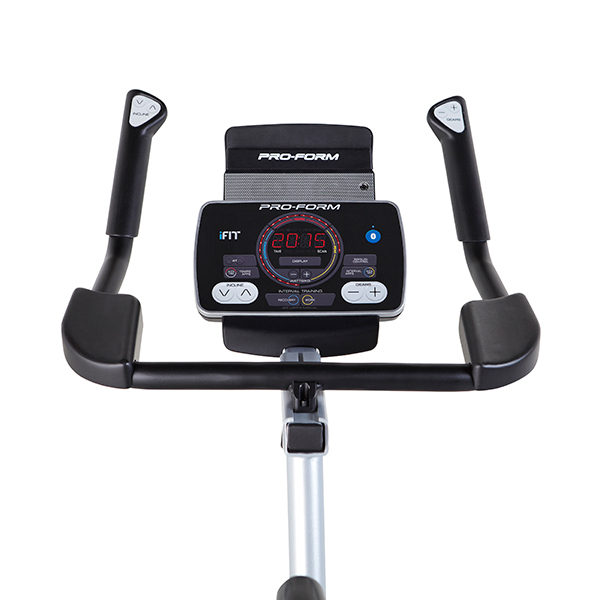 Click here to download the user guide for the Proform Tour de France Indoor Trainer Cycle.